Along the A84 Callander road, just going out on the east side of town, take the signposted road up and up and towards the car-park for the Bracklinn Falls. Another mile past here, keep your eyes peeled for the Wishing Well sign on the right-hand side of the road. From here, walk straight up the hillside for 150 yards (137m) and zigzag about. You’ll see it! 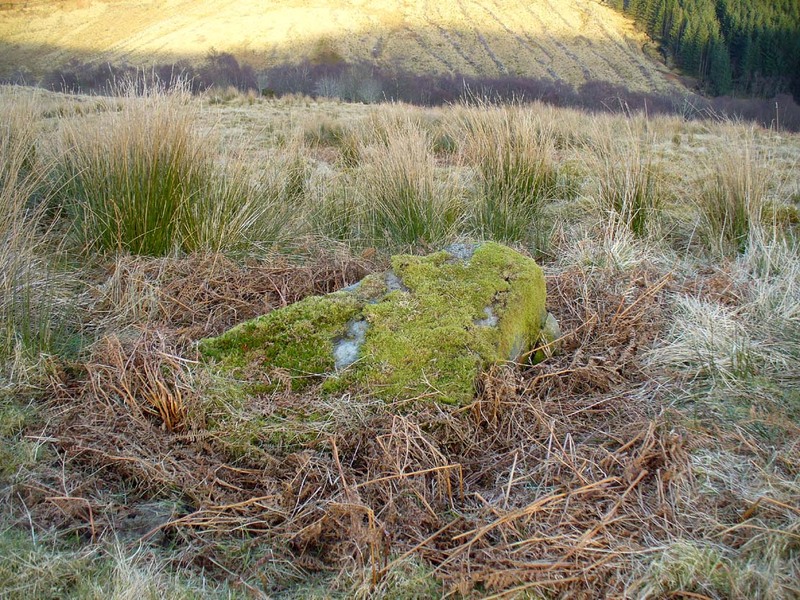 This small standing stone (not previously recorded) hides away up on the hillside not far from the old Tobhar na Cailleach (nowadays demoted as a just a Wishing Well), with its history and traditions seemingly long forgotten. About 3 feet high and barely a foot thick, it may once have had a companion standing just a few yards away by its side, where now lays a moss-covered stone. It reminded me a little of the stone pairing called the Cuckoo Stones near Wuthering Heights at Haworth, West Yorkshire. Slightly higher up the grassy slope, 15-20 yards away, we find a low line of ancient walling that runs slightly uphill and then across a slightly level piece of land for about 40 yards, before turning back down the hillside and towards the road below. 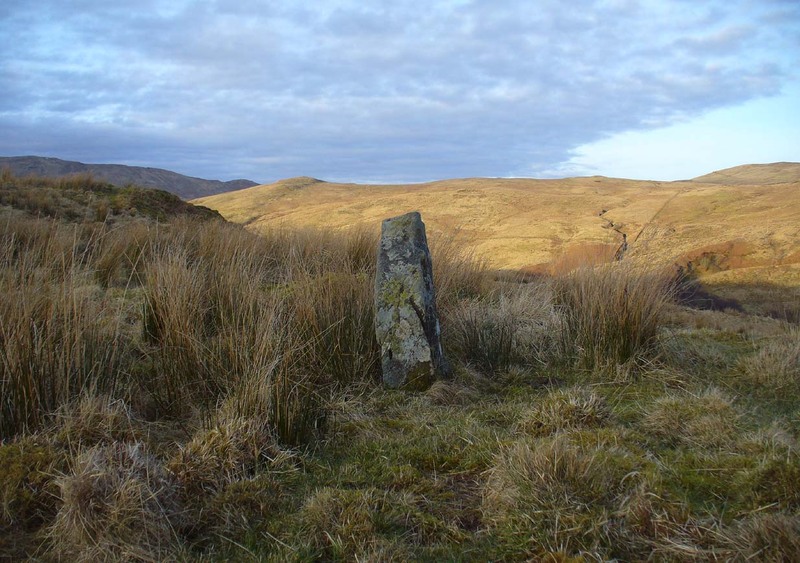 Although we have no recorded traditions of this stone, it needs to be highlighted that the waters, the woods and the slopes below this stone are dedicated to the Cailleach – the great prima Mater of Scottish and Irish traditional history. Acknowledgements: Many thanks to Nina and Harris and Paul Hornby for their help on the day of this find. 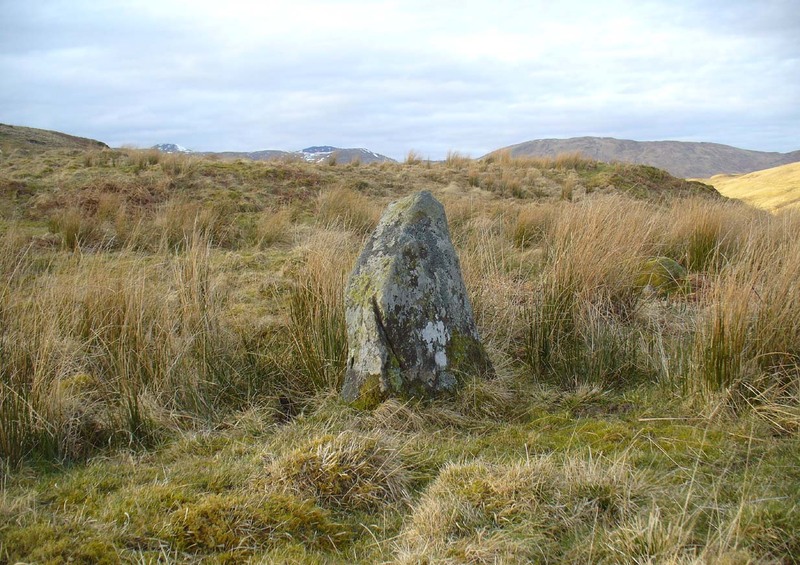 This entry was posted in Perthshire, Scotland, Standing Stones and tagged antiquarian, antiquities, Archaeology, Bronze Age, cailleach, Callander, earth mysteries, heritage, megalithic, Megaliths, monoliths, neolithic, Perthshire, prehistoric sites, sacred sites, Scotland, Standing Stones, Stirling. Bookmark the permalink. I had an explore of that area but didn’t know about the stones – didn’t see them either unfortunately.